I last blogged just before we left the airport to meet Rohit for the first time and you will all be anxious to know if he arrived safely. Well he did. Here he is in full flow this afternoon (3/11/11) at the UNICEF headquarters in Lusaka. This was our second working session with UNICEF since Rohit’s arrival and we are ruthlessly focussed on the Logical Framework for the project which will define the roles of the project partners very precisely and provide the basis for the evaluation of the trial. The starting point for the Logical Framework is the ‘project logic’ table which we first published here. we’ve had a thorough look at this and we’ve decided that it needed a bit of a review if we are going to draw out the essence of what is unique about the ColaLife trial. 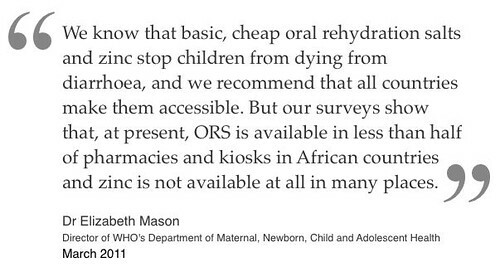 So we are steadily moving away from an emphasis on USE of ORS and Zinc in the treatment of diarrhoea to a focus on ACCESS and availability of ORS and Zinc. Up until today I have found it very difficult to engage with the whole logical framework thing and I’d put it down to the fact that I don’t find logical frameworks very stimulating. I now realise that I was feeling less than enthusiastic because the version we were using was taking us somewhere where I didn’t want to go. It just didn’t feel quite right. Now I’m much more comfortable now. I think we are definitely heading in the right direction. We will publish the revised logical framework here as soon as it is completed. On Wednesday I flew to Johannesburg and was very pleased to do a TED-style presentation on ColaLife to open day 2 of the wonderful ICT4RD (ICT for Rural Development) conference run by SANGONet (Southern African NGO Network). I’ve been watching the ICT4D movement for many years from the outside and always wanted to get involved and now I am. It was great to meet some familiar faces there from the UK: Pete Cranston and William Hoyle. William was CEO at CTT when I was at ruralnet|uk and we worked closely for several years on third sector ICT projects in the UK. William now runs techfortrade which is working to improve the livelihoods of small producers in Africa through the use of technology. It’s great to be able to continue a friendship and working relationship in a completely different environment. William will be passing through Lusaka next week so we will have more time to catch up then. The tweets tagged #ict4rd are here. Tomorrow we are introducing Rohit to Mobile Transactions Zambia and our contact at The Ministry of Health.